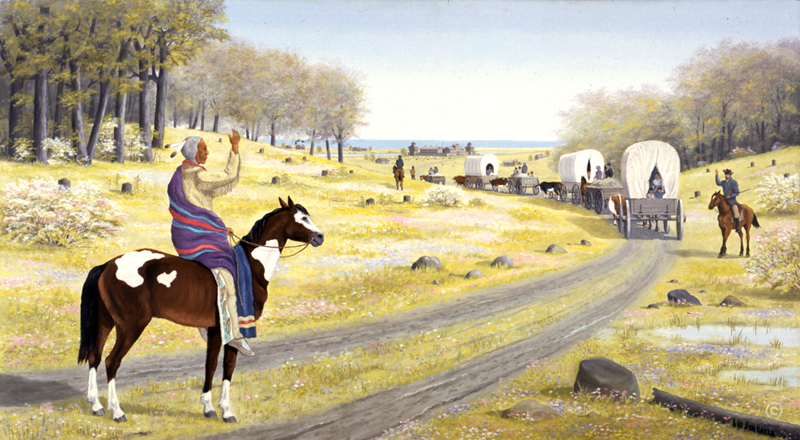 In this painting by artist Les Schrader, Potawatomi Chief Aptakisic says goodbye to Naperville settlers after escorting them to Fort Dearborn in Chicago during the Black Hawk War of 1832. If you’ve traveled anywhere near Vernon Hills, Lincolnshire, or other Chicago suburbs in Lake County, you’ve likely encountered the rush hour misery that is Half Day Road, also known as Illinois Route 22. That two-to-four-lane, rural-feeling stretch of road can sometimes take you 40 minutes to drive only 10 miles. The name feels fitting, though probably even more so during the early 20th century, when travel to and from Chicago was conducted via slower modes of transportation. Travel time forms the basis of a common theory about the name’s origins. As we dug into the area’s history we learned something quickly: The idea that the road was named for the amount of time it took to travel from somewhere to ... somewhere else ... is a misconception. It’s actually a misconception within a misconception: It’s a miscon-Inception! And we say that not to poke fun at folks who’ve lived with the wrong idea for years but because — in a strange twist of fate — the semantic slip-up associated with “Half Day” isn’t limited to Lake County. Nope, this seemingly unique naming quirk extends well beyond the Chicago region; it’s repeated nearly 600 miles away. The crux of the misconception is that it used to take a half-day to travel from Chicago to Half Day the town, which hasn’t existed for about 20 years. If you lived in the area, you might remember the place. Or not. It was an unincorporated area with just a few hundred residents. It was originally bordered by Vernon Hills and Lincolnshire, and it sat atop the intersection of Olde Half Day Road and Milwaukee Avenue. In late 1993 it was annexed, with Vernon Hills taking large portions and Lincolnshire grabbing most of the remainders. Half Day was a town of many firsts for Lake County. Established in 1836, it was the site of the county’s first post office, its first school and its first white settler. The road came after the town, and with it, a cascade of mistaken origin stories. As such, Half Day’s fake origin story has long held up in Lake County — even to those closest to it. Take Louis Tricoli, the co-owner of the historic Half Day Inn, which had stood for more than 160 years before its demise in 2007. “I had heard that it was a half-day’s ride from Chicago,” Tricoli said, adding that it wasn’t until he and his partner purchased the place that he dug deeper into the history. While there isn’t a ton of information out there about who Aptakisic was as a person, Diana Dretske, a historian with the Lake County Discovery Museum at the Lake County Forest Preserves, said we do know what impression he left on non-natives. “Aptakisic was known to have been very welcoming to the settlers,” she said. Henry Blodgett, the son of a DuPage pioneer, wrote in a letter that Aptakisic had helped protect his family and others from an attack during the Black Hawk War in 1832, leading them from Downers Grove to Fort Dearborn along the Chicago River. It was Aptakisic who decided that all of the young Potawatomi warriors be held in a camp along the Des Plaines River until the end of the Black Hawk War, lest they be tempted to join the fight against the white settlers. Lake County’s first permanent white settler, Daniel Wright, recalled that the chief and his tribe helped him build his home, tended his crops, and cared for his family after he moved to the area in 1833. We can’t, however, say for sure whether Aptakisic was “kind” because it was in his nature, or because he felt it was the best political strategy for his people. “It seems that the people that he did get close with tended to be the people who ended up being the leaders of the community, people who were respected,” Dretske said. In her book Rising up from Indian Country: The Battle of Fort Dearborn and the Birth of Chicago, author Ann Durkin Keating writes that Potawatomi leaders in Illinois feared joining Sauk warrior Black Hawk in his eponymous war against the United States because such an alliance might “lead to an ‘uncompensated removal’” from the land. If this was indeed one of their motives for remaining peaceful, it worked in their favor: In addition to exchanging five million acres of land in northeast Illinois and southeast Wisconsin for five million acres of land west of the Mississippi River, the Treaty of Chicago afforded the Potawatomis between $500,000 and $1 million in immediate payments, including thousands of dollars in annuities. Aptakisic was among the leaders who helped negotiate the treaty. It was unclear, though, whether he agreed with the details of the final agreement or not. Regardless, it was in 1836 — after the treaty was signed but before the Potawatomi were expelled — that the area’s settlers decided to name their town after the soon-to-be-departing chief. Edward Callary, author of Place Names of Illinois, said the name “Half Day” and its variations follow a popular mid-19th century trend, when many American communities, post offices, railroad stops and other places were named for local Native American leaders. The names were often applied long after Native American influence in the area had ceased. Callary says Native American names were great candidates for place names because, to white settlers, they evoked the memory of something great that no longer posed a threat. It’s no wonder that, beyond Chicago’s hockey team, “Black Hawk” is a familiar name around Illinois; there’s a Black Hawk Elementary School in Springfield, an unincorporated town in northwestern Illinois called Blackhawk, a Black Hawk State Historic site, and Black Hawk College. The list goes on. Aptakisic, however, didn’t appear to pose any threat. The settlers’ choice to name the town Half Day seemed to have originated from a place of love — or at least admiration and respect. Remnants of Aptakisic’s legacy can be found across Lake County: Aptakisic Road, Aptakisic Creek, the old Aptakisic community, the Wisconsin Central Railroad’s Aptakisic stop, Half Day Road and Olde Half Day Road, which was the original Half Day Road, before it was replaced by the longer, modern-day Half Day Road. How did the name’s meaning get confused? And, when? Perhaps right around the time the town was being named. Some sources, like Living History of Illinois and Chicago, say that the town’s true name was Halfda, in honor of the chief, but that it changed when an early cartographer spelled it “Half Day.” This isn’t so confusing that we lose the meaning of the name yet, but it’s confusing nonetheless. Dretske believes the real confusion over the name’s origin began around the 1840s, when non-residents began paying visits to the newly-built Half Day Inn near the intersection of present day Milwaukee Avenue and Olde Half Day Road. Dretske adds that the name’s mistaken meaning was kept alive when the Wisconsin Central Railroad began making stops at Prairie View in the late 1880s, which would have taken quite a long time to get to from Half Day, and vice versa. She points to one early piece of evidence (or at least an allusion to it) within a historical account of the town written by the students of Half Day School in 1918. In it, they explain that the town was named in honor of the Pottawatomi chief “Hefda,” and that the town was located about halfway between Chicago and northern Lake County. He gives the example of Quiver Township in Mason County, Illinois, which he said is named after Quiver Creek. Right! But, of course, this has no basis in fact. “Rather, the early French explorers named this the Cuivre River from their word ‘cuivre,’ which means ‘copper,’ because they mined copper from the river,” Callary says. There are tons of examples like this, he says, and Half Day is just one of them. Which makes us wonder: With a name like Half Day, was there ever a chance that Aptakisic’s legacy could have lasted longer than a decade or so? Consider this: When Aptakisic moved west towards Kansas, per the Treaty of Chicago, and ended up near Elmont, he met white settlers that grew fond of him, and later named a creek and a cemetery after him. And, as that author did his own research into Kansas’ own “Half Day,” he eventually found Aptakisic and — as we know by now — a much more meaningful origin story. Laura Pavin is a freelance journalist in Chicago and reports for WBEZ’s Curious City. Follow her on Twitter @LauraPavinNews.